Shane Shirley : Want an Easy Way for You and Your Family to Eat More Greens and Save Money? Want an Easy Way for You and Your Family to Eat More Greens and Save Money? Want An Easy Way to Eat More Organic Greens and Save Money at the Same Time? Do you struggle to get your family to eat five or more servings of fruit and vegetables each day? Do you want your family to eat more foods like Acai, kale, beets or alfalfa, but your kids have turned up their noses and you are ready to throw up your hands and give up on the greens? Well here is the answer you have been waiting for! 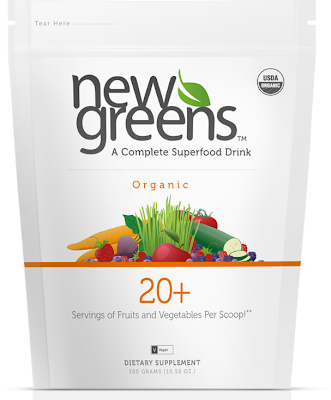 Introducing NewGreens Organic™ for The Whole Family - 1 Scoop = 20 Servings of Fruits & Veggies! NewGreens Organic by Pure Prescriptions is a comprehensive green drink, featuring whole food fruit and vegetable dehydrated juices and herbal extracts. Just one scoop of NewGreens Organic provides over 20 servings of fruits and vegetables, as well fiber, superfoods and antioxidants like Brazilian Acai and Goji beries. Even kids can enjoy NewGreens Original and Organic (Berry flavor is specially designed for adults for its energizing formula). The recommended dosage is ¼ to ½ scoop for kids ages 2-6, ½ scoop for ages 6-12, and a full scoop for kids 12 and older. A green drink is such an easy way to get the fruit and vegetables you and your family need, but you have to be careful as not all green drinks are created the same. Some are full of artificial flavors and colors which we are all trying to stay away from right? You can rest easy with Pure Prescripton NewGreens. All ingredients in NewGreens Organic are 100% certified organic, GMO free, vegan, gluten free - with no artificial flavors, colors or dyes, sugar, or dairy. 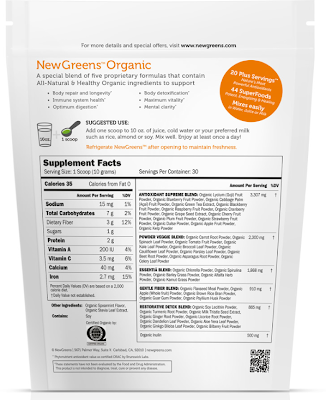 NewGreens Organic features a minty flavor that can easily be mixed with just cold water. Other popular ways to serve up NewGreens Organic is in almond or soy milk or in fruit smoothies. A customer favorite is to blend a frozen banana, coconut milk, pineapple and a scoop of NewGreens for a tropical smoothie that’s full of antioxidants. Coupon Code for 10% Off Pure Prescriptions Organic NewGreens PLUS Free Shipping! to try NewGreens for yourself AND get 10% off PLUS FREE SHIPPING and no sales tax (on US orders). Shop online at Pure Prescriptions and use coupon code NEWGREENS at checkout. Feel free to share this great offer with your friends and family too! Pure Prescriptions is an online retailer of natural health solutions and products, and committed to providing the best customer support on the planet. Customer support representatives are available by live chat or by phone (toll-free) to answer questions, and on-staff healthcare professionals provide free phone consultations for product selection. A portion of all proceeds from Pure Prescriptions benefit Vitamin Angels, a non-profit organization dedicated to providing critical nutrients to impoverished children and families. For more information, free product samples or to schedule a free healthcare consultation, call toll-free at 1-800-860-9583.